Background: Chronic kidney disease (CKD) affects the hypothalamus–pituitary–thyroid axis and peripheral metabolism of thyroid hormones, which affects the concentration and activity of the hormones. Subclinical hypothyroidism (SCH) is the most common thyroid abnormality reported among patients with CKD and it has been associated with increased cardiovascular risk. The objective of this study was to determine thyroid hormone levels and thyroid disorders among Nigerian nondialysis-dependent patients with CKD. Materials and Methods: A cross-sectional, observational study was conducted in a tertiary hospital in southern Nigeria. Nondialysis-dependent patients with CKD attending the renal outpatient clinic of the hospital were recruited over a period of 3 months. Control participants were recruited from healthy consenting hospital staff. Patients with known thyroid disease were excluded. Serum thyroxine (T4), triiodothyronine (T3), and thyroid stimulating hormone (TSH) levels were assayed using the enzyme-linked immunosorbent assay method. Results: Forty patients with CKD (26 men and 14 women) and 20 healthy adults (10 men and 10 women) were studied. The mean age of patients and controls were 54.9 ± 13 years and 44.7 ± 7.3 years, respectively. The mean T4 levels for patients and controls were 4.98 ± 1.23 μg/ml and 5.49 ± 1.06 μg/ml, respectively. The median (interquartile range) values of T3 and TSH for patients were 0.8 (0.7) ηg/ml and 2.6 (3.1) μIU/ml, while that of the controls were 1.85 (2.1) ηg/ml and 1.4 (3.1) μIU/ml. Overt biochemical hypothyroidism was seen in 22% of patients while 10% of patients had SCH. Conclusion: Overt biochemical hypothyroidism was more prevalent among nondialysis-dependent patients with CKD compared to SCH in this study. A larger population study should be performed to confirm this finding among Nigerian patients with CKD. The thyroid gland regulates the majority of the body’s physiological actions through the hormones it produces. The actions of thyroid hormones include metabolism, development, protein synthesis, and regulation of other hormones. Thyroid disorders are the second most common endocrine disorder in Nigeria but its exact prevalence among Nigerians is not known. Thyroid disorders manifest as hyperthyroidism, hypothyroidism, or a subclinical state. Chronic kidney disease (CKD) is a progressive, irreversible deterioration in kidney function. It is a problem in both industrialised and developing countries of the world, having ranked 13th leading cause of death worldwide in 2013. In Nigeria, the prevalence of CKD based on hospital studies is 1.6–12.4%. Some risk factors for CKD include diabetes mellitus, hypertension, hyperlipidemia, smoking, alcohol, and obesity. A relationship exists between the kidney and thyroid gland such that the thyroid hormones are involved in the kidney growth, development, and maintenance of water and electrolyte homeostasis. The kidney, on the other hand, is an important target organ for thyroid hormone action and plays a role in the regulation, metabolism, and elimination of thyroid hormones. CKD affects the hypothalamus–pituitary–thyroid axis and peripheral metabolism of thyroid hormones, which affects the concentration and activity of the hormones. Thyroid disorders reported in patients with CKD include overt biochemical hypothyroidism, subclinical hypothyroidism (SCH), and low triiodothyronine (T3) syndrome but SCH is considered the most common disorder in patients with CKD.,, SCH is defined as an elevation in serum thyroid stimulating hormone (TSH) concentration with normal free thyroxine (T4) serum concentration. One study showed that approximately 18% of patients with CKD have subclinical primary hypothyroidism. SCH is associated with the markers of cardiovascular risk and cardiac impairment. It may therefore be necessary to monitor thyroid hormone levels in these patients closely so as to allow for the detection of SCH. The prevalence of hyperthyroidism in patients with CKD is same as it is with the general population; thus, CKD is not directly associated with hyperthyroidism. There is a paucity of published work on thyroid hormone levels among patients with CKD in Nigeria. This study was conducted to investigate thyroid hormone levels among Nigerians with nondialysis-dependent CKD to determine the prevalence and spectrum of thyroid disorders in them. This study was a cross-sectional, observational study conducted in a tertiary hospital in southern Nigeria. Ethical clearance for the study was granted by the Hospital Research Ethics Committee. Nondialysis-dependent patients with CKD attending the renal outpatient clinic of the hospital from June 2017 to August 2017, a period of 3 months, were recruited consecutively once they met the inclusion criteria. Inclusion criteria were: nondialysis CKD patients above or aged 18 years and being in stable health as at the time of recruitment for the study. Patients with CKD on maintenance dialysis, having a current illness, and those with known thyroid disease were excluded from the study. Healthy adults 18 years or older without a history of hypertension, diabetes, kidney disease, or thyroid disease were recruited from hospital staff as controls after giving their consent. Forty patients and 20 healthy controls were recruited for the study. The following information was obtained from participants: age, gender, history of hypertension and diabetes, weight, height, and blood pressure. Blood samples were collected to determine the serum levels of creatinine, T3, T4, and TSH. Weight was measured using a standardized weighing scale to the nearest 0.1 kg, while height was measured using a stadiometer. Blood pressure was measured on the left arm of participants in the sitting position after at least a 5-min rest. Venous blood samples were obtained from participants for the determination of serum creatinine, TSH, T3, and T4. Serum creatinine was determined per standard protocol using the modified Jaffe’s method. The thyroid hormones TSH, T3, and T4 were determined by enzyme-linked immunosorbent assay method (Teco Diagnostics, Anaheim, CA, United States). Reference ranges for the thyroid hormones were: T4: males: 4.4–10.8 μg/dl, females: 4.8–11.6 μg/dl. T3: 0.52–1.85 ηg/dl, TSH: 0.4–4.2 μIU/ml. Reference range for serum creatinine was 0.6–1.2 mg/dl. Hypothyroidism was defined as the presence of elevated TSH and low T4 in a participant while SCH was defined as the presence of elevated TSH values with normal T4 values. Hyperthyroidism was defined as the presence of low TSH and high T4 in a participant. Participants with low TSH and low T4 values were considered to possibly have pituitary disease. Data obtained from the study were analysed using the Statistical Package for the Social Sciences version 21.0 software (IBM-SPSS, Armonk, NY: IBM Corporation). Data were presented as tables and charts. Continuous variables were expressed as means and standard deviation or median and interquartile range as appropriate while categorical variables were expressed as frequencies and percentages. The mean values of the patient and control groups were compared using the independent Student’s t test where the variables were normally distributed while the median of non-normally distributed variables was compared using Mann–Whitney U test. Proportions were compared among the groups using chi-square test. Spearman’s rank correlation was used to determine the association between continuous variables. P values less than 0.05 were taken as significant. Forty patients with CKD were studied and consisted of 26 men (65.0%) and 14 women. Twenty adults without CKD or thyroid disease were recruited as the control group and consisted of 10 men and 10 women. Overweight and obesity were seen in 14 (40.0%) and 5 (14.3%) patients with CKD, respectively while for the control group, 8 (40%) and 3 (15%) were overweight and obese, respectively. Twenty-nine (74.4%) of the patients were known hypertensives while 10 (25.0%) had diabetes [Table 1]. The mean age of the CKD group was 54.9 ± 13.0 years and it was significantly higher than the mean age of the control group which was 44.7 ± 7.3 years [Table 2]. The mean body mass index (BMI) of both groups was not significantly different. Median systolic blood pressure was above normal range for the patients and significantly higher than that of the control group. The mean diastolic blood pressure for both groups was within normal range values. The CKD group also had significantly higher median serum creatinine compared to the control group. 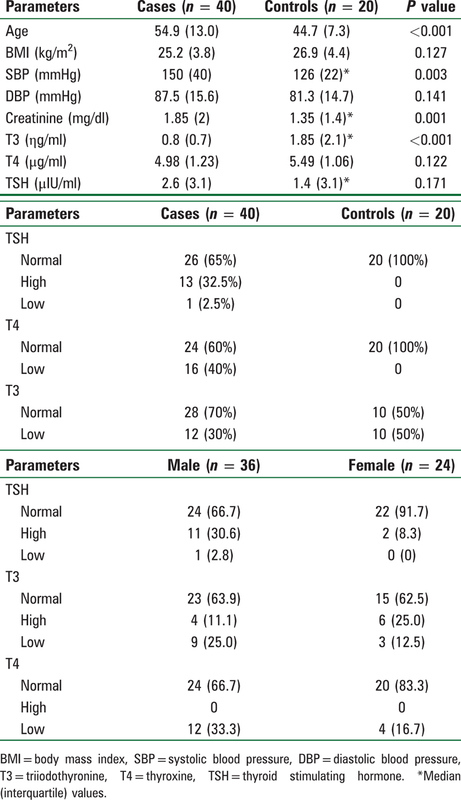 The mean values of T4 and median values of TSH and T3 for both groups fell within normal range [Table 2]. [Table 2] also shows thyroid hormone levels of study participants. Serum TSH levels were normal in all control participants and 26 (65%) patients, while 13 (32.5%) patients had elevated TSH values. One (2.5%) patient had low TSH. Serum T3 levels were normal in 28 (70%) patients and 10 (50%) control participants but low in 12 (30%) and 10 (50%) patients and control participants, respectively. Serum T4 levels were normal in 24 (60%) patients and all control participants. However, low T4 levels were observed in 16 (40%) patients. Twenty-nine patients had CKD stage 1–3 while 11 had CKD stages 4 and 5. Mean serum T3, T4, and TSH levels for patients with CKD stages 1–3 and CKD stages 4 and 5 were 0.73 ± 0.39 ηg/ml, 5.04 ± 1.26 μg/ml, 3.92 ± 3.27 μIU/ml and 0.78 ± 0.42 ηg/ml, 4.90 ± 1.24 μg/ml, 3.43 ± 2.05 μIU/ml, respectively and they were not significantly different. 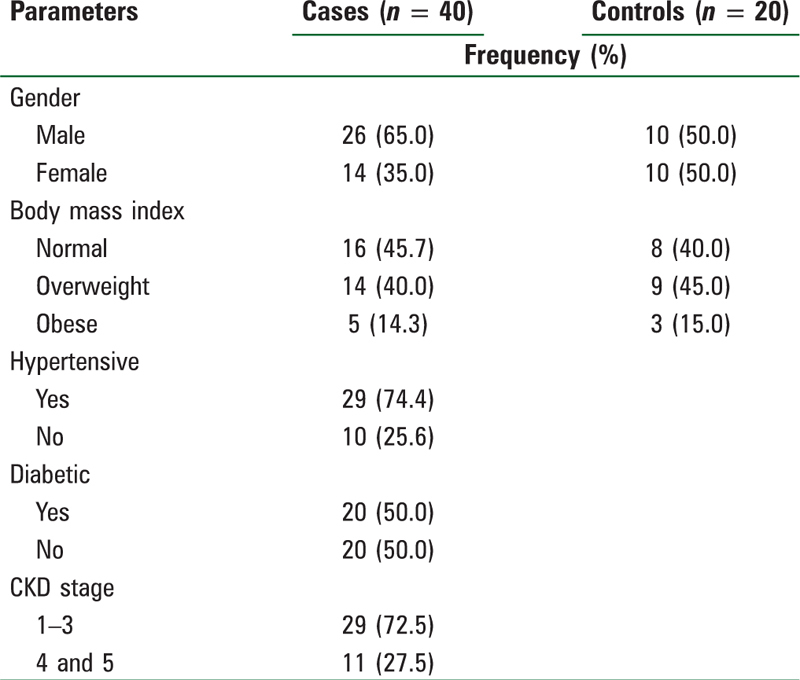 More male participants had abnormal thyroid hormone levels compared to female participants but this did not reach statistical significance [Table 2]. On the basis of the findings in this study, there was a negative correlation between age and serum T3 levels (P = 0.000, r = −0.436). In addition, serum TSH levels had a negative correlation with BMI (P = 0.043, r = −0.273), T3 (P = 0.038, r = −0.269), and T4 (P = 0.034, r = −0.273). There was a positive correlation between T3 and T4 levels (P = 0.000, r = 0.511) [Table 3]. Abnormal thyroid profile among the patients with CKD studied suggested hypothyroidism in 9 (22%), SCH in 4 (10%), and pituitary disease in 7 (18%) [Figure 1]. All control participants were euthyroid but half of the control participants had low T3 levels [Table 2]. The main disorder of thyroid hormones among participants in this study was hypothyroidism − overt biochemical hypothyroidism in 22% and SCH in 10%. This finding agrees with that of previous studies which reported hypothyroidism rather than hyperthyroidism among patients with CKD. SCH is the most commonly reported thyroid abnormality among patients with CKD with a prevalence that ranges between 17.9 and 39.9% but the prevalence of SCH in the present study was low compared to that of previous studies.,,, However, there have been no reports on abnormal thyroid function in our population of patients with CKD, so, it is possible that thyroid abnormalities are different among patients with CKD in our locality, with hypothyroidism being more common than SCH. Hypothyroidism (overt or subclinical) is associated with increased mortality from cardiovascular disease. Altered cardiac function seen in hypothyroidism includes impaired systolic and diastolic function, impaired vasodilation at the endothelium, dyslipidemia, atherosclerosis, and arrhythmias., Newer mechanisms being proposed for the increased mortality of patients with CKD with hypothyroidism include increased vascular calcification and platelet reactivity leading to thromboembolic events. Glomerular filtration rate (GFR) is known to influence thyroid function, for the results of previous studies demonstrated increasing prevalence of SCH with decreasing GFR., In the present study, there was no correlation between estimated GFR and the thyroid hormones. In addition, a comparison of mean thyroid hormone levels of patients with stages 1–3 CKD and those with stages 4 and 5 CKD did not show statistically significant difference. Possible ways by which CKD causes thyroid abnormalities include the following: (1) The blunting effect of uremia on TSH receptors in the hypothalamic–pituitary axis. (2) Declining GFR causing decreased clearance of cytokines such as tumor necrosis factor alpha and interleukin-1, which decrease the peripheral conversion of T3 to T4 as well as decreased clearance of iodine and other goitrogenic substances leading to hypothyroidism. The male patients with CKD had more thyroid abnormalities than the females but this difference did not reach statistical significance. This finding agrees with the study by Chonchol et al. in which gender did not affect the prevalence of SCH. However, it is generally accepted that women have higher prevalence of thyroid abnormalities compared to men in the general population.TSH and BMI in the present study had a negative correlation indicating an inverse relationship. This agrees with the findings in a study among 735 euthyroid individuals in which BMI and TSH had a negative correlation in male participants but although in female participants TSH levels increased as BMI decreased, this did not achieve statistical significance. T3 levels in the present study had a negative correlation with age. This agrees with the findings in previous studies, for T3 levels have been shown to decrease with increasing age. It is thought that age-dependent decline in T3 levels is due to the decreased deiodination of T4 to form T3 that occurs with advancing age. In addition, the prevalence of anti-thyroperoxidase and anti-thyroglobulin antibodies increases with age, especially in women above 60 years of age and this may contribute to the decrease in T3 levels with advancing age. In conclusion, overt biochemical hypothyroidism and SCH were the predominant thyroid abnormalities found in this population of nondialysis-dependent patients with CKD. More studies involving large population size are required to ascertain this finding so that routine investigation of patients with CKD in our setting for thyroid disease and treatment can be incorporated into renal care to prevent the detrimental cardiovascular effects of thyroid hormone derangement. Basu G, Mohapatra A. Interactions between thyroid disorders and kidney disease. Indian J Endocrinol Metab 2012;16:204-13. Iglesias P, Diez JJ. Thyroid dysfunction and kidney disease. Eur J Endocrinol 2009;160:503-15. Den Hollander JG, Wulken RW, Mantel MJ, Berghout A. Correlation between severity of thyroid dysfunction and renal function. Clin Endocricnol 2005;62:423-7. Chonchol M, Lippi G, Salvagno G, Zoppini G, Muggeo M, Targher G. Prevalence of subclinical hypothyroidism in patients with chronic kidney disease. Clin J Am Soc Nephrol 2008;3:1296-300. Fan J, Yan P, Wang Y, Shen B, Ding F, Liu Y. Prevalence and clinical significance of low T3 syndrome in non-dialysis patients with chronic kidney disease. Med Sci Monit 2016;22:1171-9. doi:10.12659/MSM. 895953. Chandra A. Prevalence of hypothyroidism in patients with chronic kidney disease: A cross-sectional study from North India. Kidney Res Clin Pract 2016;35:165-8. Duntas LH, Wartofsky L. Cardiovascular risk and subclinical hypothyroidism: Focus on lipids and new emerging risk factors. What is the evidence? Thyroid 2007;17:1075-87. Mohamedali M, Maddika SR, Vyas A, Iyer V, Cheriyath P. Thyroid disorders and chronic kidney disease. Int J Nephrol 2014; 2014: 520281. Shantha GP, Kumar AA, Bhise V, Khanna R, Sivagnanam K, Subramanian KK. 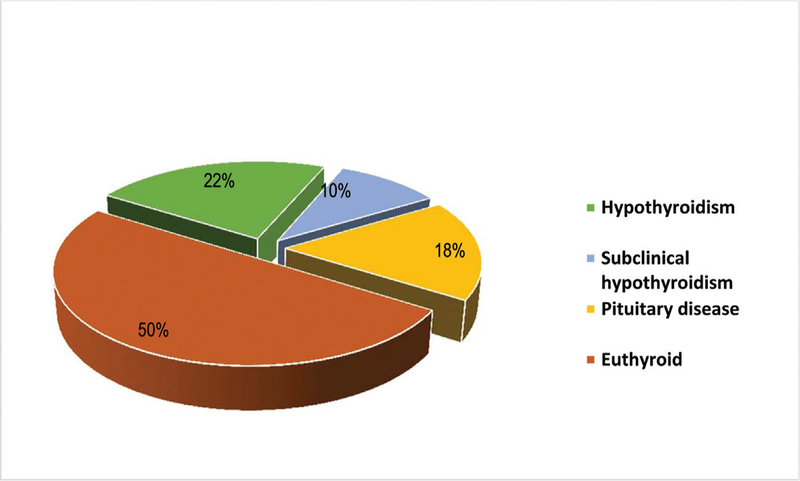 Prevalence of subclinical hypothyroidism in patients with end-stage renal disease and the role of serum albumin: A cross-sectional study from south India. Cardiorenal Med 2011;1:255-60. Khatiwada S, Rajendra KC, Gautam S, Lamsal M, Baral N. Thyroid dysfunction and dyslipidemia in chronic kidney disease patients. BMC Endocr Disord 2015; 15: 65. doi:10.1186/s12902-015- 0063-9. Klein I, Ojamaa K. Thyroid hormone and the cardiovascular system. N Engl J Med 2001;344:501-9. Klein I, Danzi S. Thyroid disease and the heart. Circulation 2007;116:1725-35. Duntas LH. Thyroid disease and lipids. Thyroid 2002;12:287-93. Coban E, Yazicioglu G, Ozdogan M. Platelet activation in subjects with subclinical hypothyroidism. Med Sci Monit 2007;13:CR211-4. den Hollander JG, Wulkan RW, Mantel MJ, Berghout A. Correlation between severity of thyroid dysfunction and renal function. Clin Endocrinol (Oxf) 2005;62:423-7. Milionis A, Milionis C. Correlation between body mass index and thyroid function in euthyroid individuals in Greece. ISRN Biomark 2013;2013:651494. doi:10.1155/2013/651494. Peters RP. Thyroid hormones and aging. Hormones 2008;7:28-35. Mariotti S, Barbesino G, Caturegli P, Bartalena L, Sansoni P, Fagnoni F et al. Complex alteration of thyroid function in healthy centenarians. J Clin Endocrinol Metab 1993;77:1130-4. Tunbridge WM, Evered DC, Hall R, Appleton D, Brewis M, Clark F et al. The spectrum of thyroid disease in a community: The Whickham survey. Clin Endocrinol (Oxf) 1977;7:481-93.